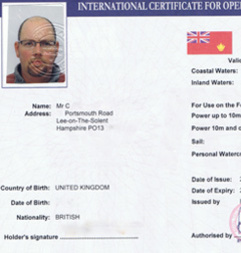 The ICC - International Certificate of Competence or your "boat license" is an important certificate to obtain before you go to European Mainland. As the skipper of a vessel, you must ensure that you are aware of any requirement for qualifications before venturing into another country's jurisdiction. In very general terms an ICC (International Certificate of Competence) is required for the inland waterways of Europe and for inland and coastal waters of Mediterranean countries. You will not be allowed to operate your vessel in other European countries without one. Indeed without such a document you may find your boat impounded for many days before you can get a suitable qualified skipper (ICC qualified...! ) to remove your boat for you. That said the time stress and inconvenience is likely to be more than enough to spoil a nice cruise on the continent. If you want to find out more about getting your boating license then click the link to find out about getting your boat license here. Boatability can help you obtain your ICC boat license via a direct assessment or through a recognised RYA training course. We also offer own boat tuition if you wanted to supply your own vessel for the under 10m ICC or over 10m ICC. If you hold a Powerboat Level 2 or other recognised RYA qualification you may be able to apply directly for an ICC. For more information on this process and to obtain an RYA application form click here. Here are a few links to useful explanations on the RYA website..